Today I’d like to know if you’ve got mail. The last time I asked this question I had 11,850 unread messages in my inbox back in August of last year. 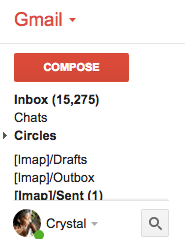 Today I only have 15,275 unread messages in my inbox. I am in terrible need of some tips on how to decrease this number. What are your good habits when it comes to decluttering your inbox? How many unread messages do you have in your inbox?